Both the architectural and interior-design language here speak of balance: a pleasing accord between tradition and modernity, ebony and ivory, solidity and lightness, simplicity and sophistication. 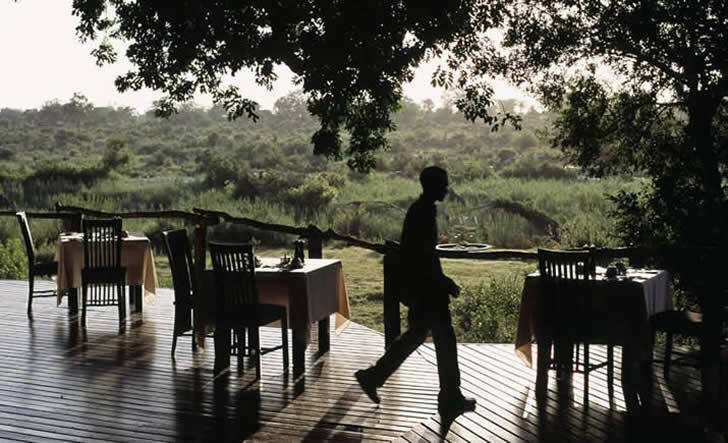 Gently nestled on the lush banks of the Sabie river, in the vast southern portion of the Sabi Sand Game Reserve that borders the Kruger National Park, Lion Sands Ivory Lodge is perfectly positioned to take in the endless procession of animals that arrives to slake their thirst at the water�s edge, as well as the magnificent predators who come to hunt them. The low-slung structure � consisting of six suites set around a communal lodge and linked by raised walkways � seeks to embrace the lay of the land with an environmentally mindful design that revolves entirely around the lodge�s river-facing aspect. In designing Lion Sands Ivory Lodge, architects Paul and Karen Wygners of Urban Solutions have expertly realised their objective of creating a building that blends into the context of its surroundings, �allowing the powerful quiet and solitude of the bush, not the structure, to dominate.� The architecture is also remarkable in its amalgamation of the traditional with the new. The thatch, for example, a very familiar building material, has been used for the roofs of the self-contained suites. However, in this contemporary update it takes the form of a modern gabled structure that, in the bedrooms, has been inset with a large sheet of glass for floor-to-ceiling drama. Apart from the obvious intention of framing the vista outside, these enormous windows mean that by day the rooms are illuminated by natural light, while at night a canopy of stars comes into view. The traditional notion of the safari-lodge suite has also been revisited, allowing guests more flexibility in how they experience the spaces. Units are accessed via a meandering path that breaks away from a raised timber public walkway. Each unit itself consists of three interconnected areas: a central courtyard with infinity pool flanked on either side by an en suite bedroom and living room. 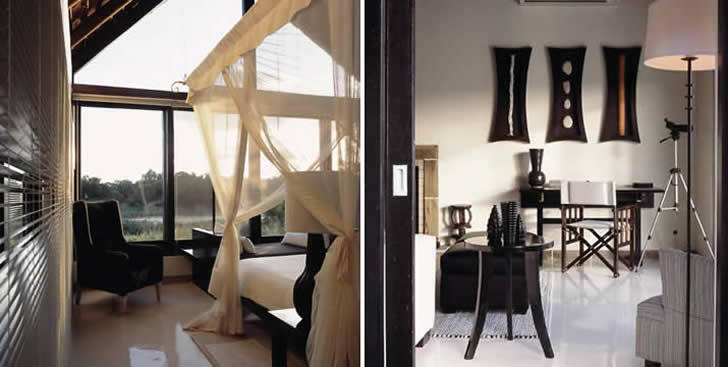 Once behind the large carved mahogany doors to their unit, guests can choose how to spend their time: game viewing from the cool of the plunge pool, reclining on the canopied bed, soaking in the organically shaped bath or colonising the comfortable living room with its large fireplace, clean-lined furniture and ebony-and-ivory colour scheme. According to the architects, the design process was not without its challenges. Removing any plant life was not an option, so the entire structure including the communal areas (incorporating a boma, restaurant, viewing decks, bar, lounge, spa and library) was manipulated around the existing rocky outcrops and trees. The job of refurbishing the lodge was recently undertaken by interior designer Paula Hattingh, who has created a classic contemporary feel that is made warm and engaging via the use of texture and the addition of a number of carefully chosen African objets such as Bamileke stools, horn bowls, inlaid boxes and carved headrests. The neutral colour scheme of off-whites anchored by chic black is very much in keeping with the associations evoked by the name �Ivory Lodge�. 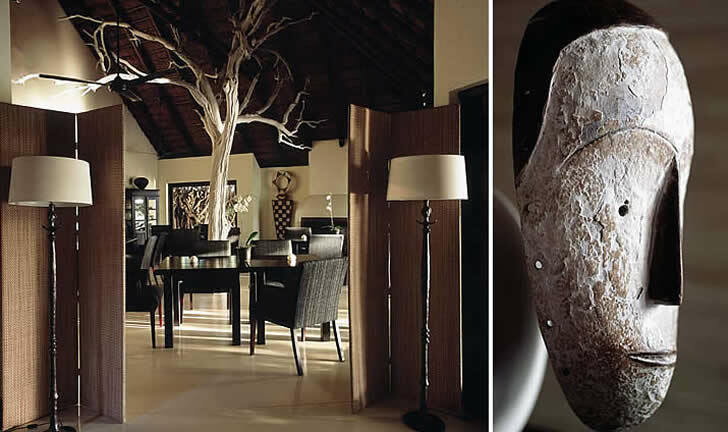 An aesthetic highlight is the dried indigenous tree in the dining room, a graphic allusion to the fragile ecosystem outside. Nowhere is the sense of a borderless space more apparent than in the lodge�s two tree-house escapes, which offer guests a unique overnight experience. 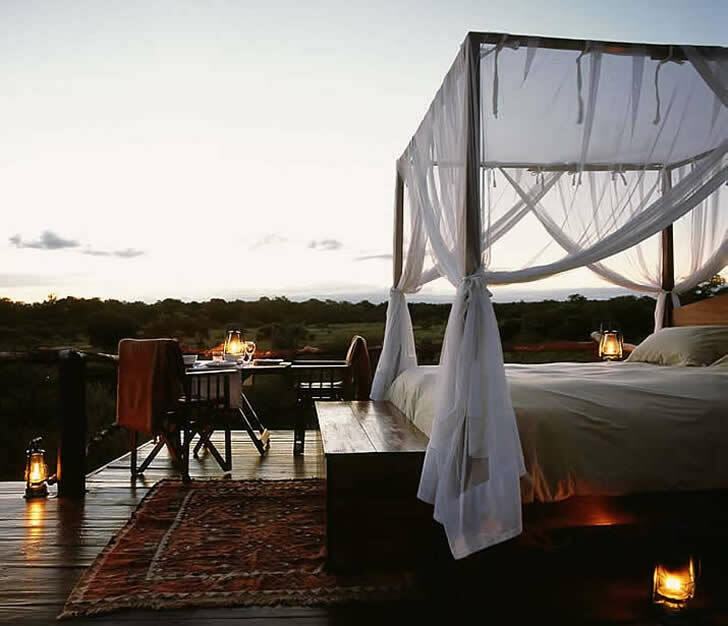 Here the furnishings are luxurious but simple (a generously proportioned four-poster bed with mosquito net, plus canvas director�s chairs, a bush table and antique wooden vanity with double basins) ensuring that the focus is directed where it should be � on the glorious natural elements above, below and around you.